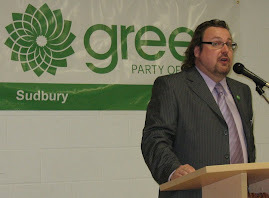 Sudbury Steve May: "Bloc Newfoundland & Labrador" Party? "Bloc Newfoundland & Labrador" Party? But, with Liberal Senator George Baker chatting with the press today about the potential inevitability (and that's a legit concept in Newfoundland) of the formation of a Newfoundland and Labrador separtist party, I felt the need to re-visit this old post. Now, you've got to take Mr. Baker with a few grains of salt, it's true. But it's really not that far-fetched to think that he's likely onto something here. The time is particularly opportune for the formation of such a beast, for all of the reasons I've identified previously (and for some of the ones George identifies in his roaring rant to the media). Ultimately, I continue to feel that this would spell bad news to our Party. But perhaps there is an opportunity sitting here for us to seize on? I don't think that the Green message has really resonated that well with Newfoundlanders, but if the winds of change are truly starting to blow in off of the mainland, perhaps we can steal some of the gail and turn our own ship around. Rather than a "Bloc Newfoundland", how about a Green Party committed to fight the good fight for Newfoundland and Labrador? To honour agreements with the Province made by previous governments. To agree to, once and for all, resolve the boundary disputes with Quebec (which are starting to cause tensions now that Quebec has decided to dam some of the rivers flowing out of Labrador for hydro-electric projects). We need to explain to Newfoundlanders that a tax on carbon will not kill off shore oil development, but will instead position the economy for a more sustainable, and ultimately more green, form of energy development. Investments in alternative energy, such as tidal, could also be made in Newfoundland. And then there are all of the rest of our good policies which make sense throughout Canada. I'm just not sure what we would tell Newfoundlanders about the seal hunt that they would want to hear. But we might be able to think of something. I've heard it said that the seal hunt is to Newfoundland like arts funding is to Quebec. Unless we begin to make a concerted effort to woo the voters of Newfoundland and Labrador into our camp, offering them a chance for real change within a national framework, I really do believe that Mr. Baker's prediction might come true. And while I would hate to see a "national" political party waving the pink-white-and-green flag of separatism, I also can't blame Newfoundlanders for feeling that their voice isn't being heard in Ottawa. Kind of like the 7% of Canadians who voted for the Green Party in the last election!